Vision deficits can mimic and/or contribute to behaviors observed in children with ADD and ADHD. The classic symptoms of attention disorders are hyperactivity, an inability to focus, poor impulse control, task avoidance and disruptive behaviors. In order to diagnose these conditions, the medical practitioner looks at a series of subjective markers. Medicines are given to treat the symptoms, but they do not cure the cause. Data shows that about 4-12% of school aged children have ADHD. In addition, 20% of students in schools have visual problems that contribute to disruptive behaviors. It is estimated that 25% of students have visual problems that affect their ability to learn. These kids may not all demonstrate poor behavior, but they may struggle with task completion and poor attention. What Is It Like to Have Visual Deficits When You Are a Student? You find close up tasks confusing. You can’t pay attention to details. You are challenged by organizational tasks. Words on a page appear blurry. The lines on the paper seem to move or jump up. You try to read, but you lose your place on the page. You see everything blurry. It has always been that way, so you don’t know any better. Although you get enough sleep, you’re often tired at school or when you do homework. You feel dizzy, or nauseous, because words, lines, shapes move around too much. You cannot read properly. When you try, it taxes your system so much you cannot sustain it. It takes you longer than your classmates to realize what color is in front of you. It’s easier to look out the window than at the blackboard. School is boring, because you can’t do the work anyway. So you wiggle, get up, and try to get your classmates’ attention. Your teacher finds your behaviour disruptive, or complains that you daydream excessively. You feel different, not as smart as the other kids. It’s so hard to concentrate. You get frequent headaches, and eye strain. Doing your homework takes you a long time. You are unaware that you avoid work as a coping strategy. The basic vision test commonly used in a doctor’s office or in school does not screen for the type of visual challenges that can contribute to a child’s poor behavior and learning difficulties. Children can test 20/20 on a vision test and still have problems with eye focusing, eye movement, eye teaming (convergence), as well as color and visual discrimination. Some of our young clients have convergence issues. As a matter of fact, children on the spectrum, or with sensory processing challenges, often have motor coordination difficulties which may also affect the way their eyes work together. CDI’s occupational therapists look at a child’s performance while he does a variety of tasks. We look for signs of problems such as poor eye-hand coordination, misalignment of both eyes, poor depth perception, clumsiness and more. If we suspect a problem we will recommend a full evaluation by a developmental ophthalmologist. However, children who were born with visual issues often have developed coping strategies that make it hard for others to identify these challenges. Since behaviors can be an indicator, any child with developmental challenges should also be evaluated for underlying visual difficulties. Experts recommend that all children with developmental delays be seen by a pediatric ophthalmologist, especially before being diagnosed and medicated for ADD or ADHD. Many visual deficits are easier to treat when caught early. Please speak with your doctor and your CDI therapy team for more information about the visual challenges associated with ADD/ADHD behaviors. Family dynamics can make a parent feel invisible. All families are complex and rich with unique patterns that get created early on. A dominant parent can emerge because of personality differences and family habits. Both parents, however, have an important role to play in their child’s development. Research shows that children benefit greatly when their dads participate in their lives. Not so long ago, fathers were often kept out of the parenting loop. The growth of two-income families in our society has recently changed the rules. Biology, however, does not care about societal constraints. Just like mothers do, men undergo hormonal changes when they are about to have a baby, and in the year following the birth of their child. Their testosterone (male hormone associated with virility and aggression) goes down, while their oxytocin (so-called love hormone) goes up. These hormonal shifts make both men and women more nurturing, but there are some differences. Males make oxytocin when they physically play with their child, while females produce more of the hormone when they hug and cuddle with their offspring. There are many reason why fathers should be involved in their child’s therapy. 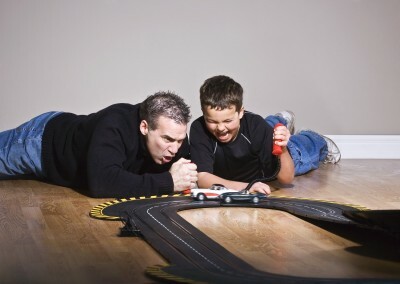 Studies have shown that fathers not only tend to play more physically with their children, but they approach play differently than mothers do. Rough and tumble activities can help a child who has poor body awareness or needs more tactile and proprioceptive (receptors in your joints that register pressure) input. The increased sensory activity can improve a child’s alertness and interaction. 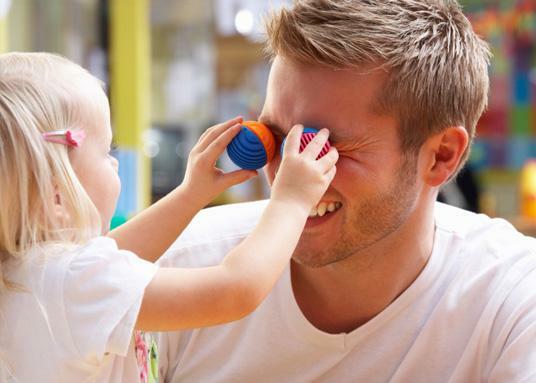 When compared to mothers, studies show that fathers are more likely to use a toy differently than for its intended purpose. The dad’s approach, in this case, is helpful to a child who needs to expand his play repertoire. involved father early on in their lives, were less likely to show behavioral problems later on. As a matter of fact, a dad’s involvement is a strong predictor of a child’s positive outcome for emotional regulation, cognition and communication. When a dad wants to spend time with his child, culturural constraints can often act as a gatekeeper. This means that a father’s participation should be encouraged through community education and early intervention services—the earlier the better. Researchers point out that with the proper professional support, fathers of children with disabilities achieve a higher level of well-being and adaptation. In addition, fathers who are supported by their partner participate more in their child’s life. A father also has the power to alleviate stress on the whole family. Studies show that fathers process stress differently than mother’s do. They can therefore provide a calming effect on the whole family. Their active participation can bring much needed relief to their partner and their child. Raising a child with or without developmental challenges, is a partnership. Fathers are an important part of the solution and should be encouraged to interact with their child. Please join us in our efforts to include fathers in their child’s therapy time and early intervention services. Talk to your CDI therapist for ideas on how to get Dad more involved. One of the questions we get asked regularly is: How come you don’t always bring toys with you when you come for an in-home session? Although there are times when it is appropriate for a clinician to bring some tools/toys from our clinic into your home, there are at least 5 good reasons why your toys and resources are often better than ours. 1. We can show you how to use the resources in your home differently The first session is about getting to know your child, your family, and your resources (e.g. toys available, outdoor equipment, craft supplies, and more). An early interventionist might ask you to show him/her what you have available for your child. To a therapist, the toys and other resources in your home, including other family members, are so much more than meets the eye. They look at each item, or person, as a means to work with your child on skills such as communication, sensory integration, fine motor skills, gross motor skills, trunk control, coordination, focus, regulation. Using your toys and resources allows us to teach you how to look at your environment in a therapeutic way. This is the best approach to help your child. It makes your toolkit more powerful long after our session is over. Our approach is collaborative, we therefore want parents to join us and learn how to best help their child to overcome his/her deficits. We realize that, once the session is over, the therapist leaves with the toys he/she brought. If you don’t have the same toys as your clinician, it might be challenging for you to continue an activity that worked well for your child during the session. The goal is for you to be able to continue working with your child after the therapist has left your home. If we use your toys instead of ours, you will be able to repeat the activity on your own and your little one will get the help he/she needs every day. Some of our most successful sessions have been with no toys at all. There are many ways to tap into a child’s motivation center and maximize therapy. Toys can sometimes distract from the actual goal. A child might benefit more from a wheel barrel race or an improvised obstacle course made from the pillows on your couch. We can use your environment in many ways to help your child. For example, pots and wooden spoons can be turned into a drum set, helping a child work on gross motor skills and coordination. Cotton balls and straws can become an improvised snowball race, giving your child a chance to work on gross motor skills and oral motor skills. No matter how little or how much you have, your home has exactly what you need to help your child. It has you and other loving family members, and it has the toys or resources you have selected especially for your child. This means that whatever is in your home has more meaning for your little one than anything our clinicians can bring into the session. Your daily routine is rich in opportunities that can be tapped into to help your child communicate, socialize and meet his/her developmental milestones. Our staff is trained to utilize the tools in your natural environment to help you and your child. Generalization, the real goal of early intervention, is the ability to take a skill learned in one environment and apply it to other situations or contexts. The toy bag comes from our clinic, therefore, it distracts from the powerful tools available to your child at all times. If we use our toys, you and your child might have fun with it during the session, but it might not lead to generalization of the skills learned. We don’t want the therapeutic outcomes to be conditional on our toys. Instead, your child’s unique environment, along with his/her family and caregivers, can help him/her reach the very best developmental results. Generalization is facilitated in a child’s natural environment, using tools, toys and resources available to him/her every day. CDI is always happy to answer any questions you may have regarding Early Intervention and the many therapeutic services we offer (e.g. Speech and Language Therapy, Occupational Therapy, Child and Family Mental Health, Developmental Support, and Therapeutic Groups). Our mission is to help all children reach their full potential by supporting the relationships and environments that shape early development. We see clients in our clinic, the community and in their homes. We look forward to helping your child reach his/her developmental milestones. Handwriting plays an essential role in a child’s developmental and educational growth. And yet, many schools are no longer teaching this fundamental skill to our children. Researchers point out that handwriting seems to strengthen brain processing, reading abilities, memory recall, and learning. Studies show that keyboarding and printing do not provide the same benefits. With all the focus on technology nowadays, it is even more important to ensure that kids acquire all the skills they need to successfully learn cursive writing. There are many benefits to handwriting. The latest studies show that cursive writing helps the brain wire more efficiently than keyboarding and printing. Students who handwrite their notes show more efficient memory recall, are better readers as well as learners, and show improved motor control. Writing cursive works on the following skills: postural control, visual-motor coordination, fine and gross motor control, decoding, and sensory processing—just to name a few. Although it may seem easier to give a child a keyboard instead of teaching them cursive, if he has issues with handwriting it is very likely that he will also have deficits in his ability to learn, read and communicate. Handwriting difficulties are closely linked to learning disabilities. Some experts worry that if we don’t teach students handwriting, we will miss the opportunity to identify the underlining deficits they may have. Occupational therapists evaluate each child for fine and gross motor skill, visual deficits, postural control and developmental delays that may affect a child’s ability to learn handwriting. Good handwriting starts with a child’s ability to sit functionally at a desk. If a student cannot achieve the proper posture, he will not be able to control his motor skills to perform fine motor tasks. His trunk strength is what allows him to sit upright for an extended period of time. Shoulder stability is also essential. Children who have poor shoulder control cannot perform fine motor movements. In addition, the child needs to see clearly as well as interpret what he sees. Occupational therapists will look at eye movement, visual motor coordination, depth perception, visual perception and then assess if vision is impeding learning. Finally, occupational therapists are trained to analyze fine motor skills, handwriting grips and finger dexterity to help a child achieve a more functional writing technique. They use fun sensory activities to help children master the foundational skills needed to learn handwriting. CDI is happy to offer handwriting classes. Handwriting Without Tears is a multi-sensory program that makes learning cursive fun and easy. This hands-on approach uses a variety of teaching strategies to fit the unique learning style of each student. Children learn through playful activities, movement, tactile and auditory input, and object manipulation. It takes the anxiety out of mastering a new skill and meets each child where he is at. CDI’s occupational therapists are not only trained to teach this effective method, but they can also help assess your child for any underlining developmental issues that may affect his learning progress. Click here for additional information on CDI’s handwriting class schedules. Occupational therapy adapts well to a natural environment. Many of our activities sneak in therapeutic work into fun and functional projects. Parents can help their children by making time at home to work on some of the same developmental skills. * Mix the Batter: This sounds simple but it becomes a different experience when you have your child use first his/her dominant hand to hold the spoon, then his or her non-dominant hand, and then both hands. Have him or her try to figure out how he could mix the batter by rotating the bowl instead of using a spoon. Then have him or her mix the batter by shaking it in a jar or plastic container. There are so many possibilities, your child can help you come up with other unusual ways to mix the batter. What is he/she working on? Increasing brain wiring and motor fluency, bilateral upper body movement, grading of movement, wrist rotation, problem solving skills, and following directions. * Pour the Batter: Give your child a 1/4 cup measurer. Have him or her pour the batter into each pre-oiled muffin cup. * Blow Bubbles in the Batter: Use plain batter for this activity. Make sure your child can follow directions, especially if the batter contains raw eggs. He/She should be able to blow without sucking through the straw. Just to be safe you can use a vegan recipe or no egg recipe. Add a little bit of extra liquid to make it easier or use less liquid to make it harder. It should be “a just right challenge” for your child. He/She should feel like it’s fun, not frustrating. Pour a little bit of batter in a large cup or a bowl. Get a few large straws and have a bubble blowing contest with your little one. You can also play his/her favorite song and every time he/she hears a certain word in the song he/she has to blow a big bubble. * Turkey Baster Batter: This is an usual way to fill your muffin tins. Have your child use a turkey baster to fill each muffin cup with the batter (this will only work with plain batter, no chocolate chips or blueberries). If necessary, add a little bit of extra liquid to make it easier. Teach him or her to hold the pinch on the bulb until the baster is over the right cup and then release. Work on counting cups, he/she has to get the batter to whatever number you call out. Play a game of right, left, down, up by directing him to your chosen cup. This works nicely for a child who is just starting to recognize his left from right. If you want to adapt it for a child who is still learning, put a sticker on his or her right hand, this way he will get to practice this skill without frustration. Offer as much assistance as needed to keep the activity fun for your child. What is he/she working on? We hope you enjoy trying some of those activities with your children. CDI therapists can provide you with developmentally appropriate activities that can easily be adapted in the home. One of the markers of autism is a person’s aversion to eye contact. The eyes are an important barometer of emotion when we interact with others. The Emotional Life of Your Brain by Richard J. Davidson, Ph.D. and Sharon Begley touches on the subject. Researchers believe that this seemingly anti-social behavior is rooted in complex brain processes, the misinterpretation of visual cues and functional coping mechanisms. People on spectrum have described looking into someone’s eyes as a terrifying experience. Davidson and his team have conducted fMRI studies to discover the inner working of the brain of subjects while processing visual cues. It turns out that the amygdala (fear and anxiety center of the brain) is bigger in children with autism. He states in his book that: “The fact that amygdala activity is elevated when autistic children look at faces—even for a few fractions of a second, as in this experiment—suggests that doing so makes them profoundly uncomfortable, even fearful, and that when they look into someone’s eyes their brains and bodies are flooded with messages that they interpret as threatening. Only by looking away can they stop this onslaught.”He also points to the fact that when the subject looks away, then the amygdala activity decreases. What we interpret as an anti-social behavior is really a calming strategy that has been reinforced over time. There’s a strong heredity factor in autism. Often entire families are studied to help understand this complex disorder. One study looked at eye tracking in the siblings of children with autism, who themselves were not on the spectrum. Interestingly enough, these children showed abnormal tracking patterns as well. Even though they did not avert their gaze, fMRI revealed that their amygdala activity was heightened when they looked at faces. Normally developing children do not show the same abnormal eye tracking patterns and amygdala response. This points to a wide range of function when it comes to social interaction competency. Richard Davidson points out that in the population at large there are people who avert their gaze when dealing with others and yet don’t fall on the spectrum. They might be called socially phobic or shy instead. All this information is a good reminder, that when we (parents, caregivers, therapists and teachers) work with kids to help normalize their social interactions, we need to be aware of the role that gaze aversion might play for a child in that moment. Some children use it as a coping strategy for dealing with an overwhelming stimuli or as a functional strategy to process and retrieve information. Any treatment approach, therefore, should respect where the child is at developmentally. Floortime Developmental Individual Difference Relationship-based model (DIR) is an excellent approach to increasing communication and social interactions. This model of therapy not only meets the child where he is at developmentally but also works with the child’s emotions and motivations to achieve better communication as well as social interaction. For more information on how Floortime DIR can help your child improve his/her social interactions, please contact the Child Development Institute. Small changes in the environment can go a long way toward helping children with sensory issues have a good time. When a beach day is what you want, a boardwalk or a park by the water can offer a nice compromise. If a child can keep his shoes on, walk on solid ground instead of the sand, climb play equipment instead of making sandcastles, and even sit on a bench in a shady area for some much needed quiet time, he is more likely to stay in balance. Remember that the proprioceptive system (sensory receptors in your joints that send information to the brain) is an incredible emotional and sensory regulator. All the pulling and pushing that happens when a child climbs on playground equipment helps to keep him emotionally regulated. But what if your child is sensitive to the pungent ocean breeze? An easy solution is to have him carry a favorite cloth with a few drops of soothing essential oil (e.g. lavender or orange). This way, whenever he is overwhelmed by the strong smell of the air, he can smell the preferred fragrance instead. Finally, keep in mind that your child will do better if you time your family’s trip to the beach according to his natural rhythm. The nervous system becomes more reactive when we’re tired. If your child has more energy in the mornings but fades in the afternoons, try to plan a breakfast or a brunch picnic by the water. The whole family will have a fabulous time. Bring a sensory community kit (a collection of items and toys that your child finds soothing). Bring plenty of drinks and food (thirst and hunger can make anyone dysregulate). Bring sun hats, sunscreen and umbrellas for shade (too much sun exposure can be draining). Bring a change of clothing for your child (children with tactile sensitivities get overwhelmed when their clothes are wet). Bring a set of headphones with your child’s favorite music (it will help tune out the noise from other people or the crashing waves). Prepare your child for what he can expect during this outing, get him involved in making a plan to help cope with unpleasant stimuli. Do some activities prior to the outing to help him experience some of the sensations he might encounter during your outing. Learn to read your child’s cues; children with sensory issues can get overwhelmed fast. Summer is a special time for parents and children to have fun and make memories together. Parents have the difficult task of respecting their child’s limits while still providing opportunities to explore and experience the world. This can be challenging—a lot of it is trial and error but remember that you are the expert on your child. The more you can just live in the moment and go with the flow, the more you will enjoy this special time with your child. Since OT Awareness Month is almost over, we thought it would be fun to share some OT sensory strategies for parents to enjoy! 1. Take an inventory of what activities you find soothing, energizing and regulating. For some parents, taking a bubble bath is relaxing and enjoyable, for others running outside is the most satisfying. 2. Survey your environment – Some adults are aware that noisy environments are draining to their nervous system, while others get energized at parties or concerts. 3. Account for all your senses – smell, visual, sounds, taste, vestibular (motion that affects your knowledge of where your body is in space), proprioception (receptors that let your brain know how much pressure or pulling your joints feel). For example, people who run for regulation are using all their senses during that activity except for taste. For more on this subject, check Winnie Dunn’s book, Living Sensationally Understanding Your Senses. By A. Jean Ayres, Ph.D. Written by the Occupational Therapist who brought awareness to sensory challenges. This book is great place to start when learning about Sensory Integration. Dr. Ayres explains how the sensory system works and paints a clear picture of how this disorder can affect a child. She also provides solutions and examples. Another great resource for parents! This books is reader friendly. It does an excellent job explaining the different ways we process and integrate sensations through our nervous system. The first part of the book educates the reader about the sensory system and the second part provides solutions for parents. This book is full of entertaining activities to do at home, at school and in the community. It’s a great way to find new ways to have fun with your child while working on some of his/her sensory processing skills. By Stanley Greenspan, MD and Serena Wieder, Ph.D.
A wonderful resource about a child’s unique development. Describes how to navigate challenges to improve a child’s abilities to communicate and participate in meaningful, developmentally appropriate activities. Emphasize working with a child’s strengths and motivation to encourage growth. Each child is unique. Here are some sensory strategies that may work for your child. Try one to two at time. If a strategy does not work, it might at a later date. For community outings, put a sensory kit together with your child favorite activities. – Fidget Toys: stress balls, putty, fuzzy balls, gel balls, Velcro, plastic figurines, Rubber Gumby bendable, soft squares of fabric, textured squares of fabric, bag of dried pasta or beans (make sure your child does not put items in mouth), small paint brush, skin brush or toothbrush, popping beads or tubes. – Bucket of dry beans, and pasta: let child run his hands through, put beans in small cup, listen to sound the beans make when they fall down. Make sure your child does not put these dried food items in his mouth. – Music: some children really respond and organize with music. – Bath or shower: let child play with the water and enjoy the many sensations this activity provides. – Bean bags: great for the wrap around feel it provides. A child can use them to sit on, lay on, or as a blanket. Some children really enjoy being sandwiched in between two bean bags with parent giving some targeted squeezes on the top bean bag for extra input and regulation. Always make sure the child feels safe during this activity and that your child can safely breathe. – Swinging or rocking: linear swinging or rocking in a rocking chair or glider can be calming for some children. – Fishes/aquarium: Many children seeking visual input are mesmerized by a fish tank. Before investing in one, take your child to a pet store or an Aquarium and see how he/she responds.